Summon an Imposter with power and health equal to the power of your most powerful creature. Imposter's Mission is an epic Strength action card. It is part of the Houses of Morrowind expansion. 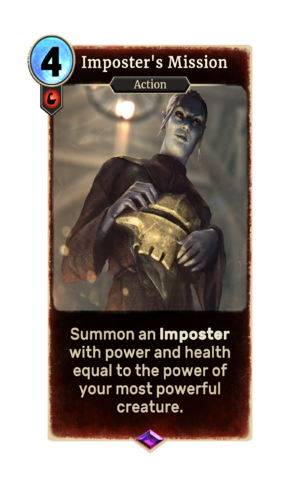 The card art depicts Nileno Dorvayn, House Hlaalu's steward in Morrowind, holding a Redoran Bonemold Helm, a reference to the House Hlaalu quest Disguise. This page was last modified on 19 December 2018, at 03:22.